You can add agents and administrators manually, through a bulk import of users, or through the Zendesk API. You must be an administrator to add agents and admins. To add users in a bulk import, see Bulk importing users and organizations. To add users with the API, see Zendesk REST API: Introduction. Tip: If you want to learn more about how to add users and define their roles, check out the Zendesk Support for Admins, I training course. Administrators can add end-users, agents, and administrators. The account owner can also add agent seats to your subscription. The account owner is included as an agent seat in your subscription. Hover over the +Add tab, then select User. Enter the user's Name and Email, then select a Role. Note: If you receive an error, you might need to purchase more agent seats. Depending on your account, owners can add agent seats a few different ways (see Adding agent seats to your subscription). In the user's profile, enter user information (see About the user options below) and set agent permission (see About agent privileges and ticket access. If you are on Enterprise, agent permissions are not set in the user profile, but are determined by the custom role you select for the agent. See Creating custom roles. If you want to add additional contact information, click Add contact, select the type of contact, then enter the contact info in the field that appears. Repeat as needed. The new user is saved automatically, so when you are finished you can simply navigate away. The new user receives the welcome email and verification link to choose a password and sign in for the first time. You can also watch this short video about adding agents. The following table describes the options that can be set for a new user. Note: On Essential, the options are limited to Role, Email, Contacts, Details, and Notes. Email Email address used for all email communications with the user. Role Defines the user's function and access level in your Zendesk Support. There are three user types: End-user, Agent, Administrator. On Enterprise, you can create custom roles for agents. Only administrators can change a user's role. For information about roles for Essential, Team, and Professional, see Understanding Zendesk Support user roles. For Enterprise, see Using custom agent roles. Contacts Other contact information for the user, such as Phone, Twitter handle, Facebook page, and Google account. Phone Personal telephone number for the user. Alias (Professional and Enterprise) Alternative name for an agent to use on all communications with end-users instead of the agent's real name. If this field blank is blank, the agent's real name will be used in email communications. Signature Closing line added to an agent's email notifications. Tags List of tags that will automatically be added to new tickets created by this user. Separate tags with a space. Tags are added to new tickets only, not updated tickets. This is an optional feature and you may not have enabled user tagging. For more information about user tags, see Adding tags to users and organizations. Organization A collection of users (both end-users and agents) created by an administrator. On the Team plan, users can belong to only one organization. On Professional and Enterprise, users can belong to multiple organizations, up to 300. A user does not have to belong to any organization, however. For more information, see About organizations and groups. Language Language the user will view your Zendesk Support in. This setting affects this user only. Time zone Local time zone for the user; used to time stamp tickets. This setting affects this user only. Details Additional details about the user. Address, for example. Details are visible to other agents but not end-users. Notes Additional notes about the user. Notes are visible to other agents but not end-users. When you add agents you need to define their privileges (groups they will be assigned to, their access to tickets, if they can make both public and private comments, and their forums access). These privileges are described in the following table. Note: On Enterprise, you set the agent's groups in the agent's profile, but you do not set agent permissions and ticket access in the agent's profile. Agent permissions and access (except for groups) are determined by the agent's custom role. Note: On Essential, the agent's profile does not include all of the permissions options described in the following table. Groups List of groups the agent belongs to. Agents must belong to at least one group. Click the group name to edit the groups for the agent. For more information about groups see, Creating, managing, and using groups. 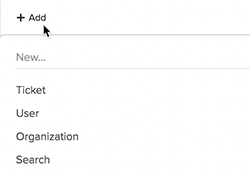 If you select to restrict the agent to an organization, you must also set the agent's organization (on the Add user page). See Restricting an agent to one organization. Notwithstanding ticket access restrictions, CC'ing an agent on any ticket lets the agent receive email notifications of all public and private updates to the ticket. Note: On Enterprise, you do not set ticket access in agent profiles. Agent permissions are determined by the agent's custom role. Comments Determine the type of comments an agent can make on tickets. Notes and replies enables the agent to add both internal notes and public replies to tickets. Notes only enables the agent to add only internal notes to tickets. Set Guide privileges for the agent. Viewer means the agent has regular agent permissions for the Help Center. Manager means the agent has full privileges in the Help Center, including modifying the content and design. See About Guide user roles. Note: You can enable agents who are Guide Viewers to add and edit articles in a specific section or posts in a specific topic (see Allowing agents to add or edit articles and Allowing agents to add or edit posts). I believe this documentation is misleading. It indicates that an agent can add end users which is not actually the case. Only a non-restricted (super) agent or admin can add end users, assign them to organization and edit their names. Agents (those that are restricted to any subset of groups as would be expected in most organizations that are actually implementing Zendesk) are not able to add end users other than through a somewhat clunky ability to add an email address. They will not be able to actually input a name for the end user nor will they be able to provide any additional useful information or attach them to an organization. This is a major shortcoming in the design (a flaw to me) that should be addressed. All agents should be able to add end users. Hey Scott! Thanks for the feedback on this. I see that you also mentioned it in a ticket with Rico. He's submitted your feedback on the documention to our Docs team to see if we can make the information more clear. Thanks for the feedback on the doc. We've updated it above. I hope it's more clear now! We want agents with restricted access as well to be able to create new end-users. Is it possible to enable somehow? For us this restriction seems pointless. Hey Kazim! What kind of restriction are you referring to? We have agents who are part of different groups. If we restrict a group of agent to have visibility of tickets in their group only then they are not able to create new End User. We want agents to only have visibility of the tickets in their group and still be able to create new end user. For us, this restriction of 'not being able to create the end user' is pointless. Thanks a bunch for the feedback and I'm sorry to hear that our agent permissions don't seem to be meeting your desired user workflow. Using the Custom User Roles feature available on the Enterprise plan level, you can restrict the ticket access of agents to only those in their own group while still allowing them to create end-users in the account. However on the plan levels which don't have the custom user roles feature, the amount you're able to customize in terms of agent access is a bit more limited. If this feature is important to your workflow, I'd encourage you to check out our doc on setting up and using custom agent roles. On the lower account levels agents either are allowed full access to tickets along with the ability to add end-users, or they are designated as restricted agents and have limited access to effect the account. Can I edit Add new user form? Now it contains following fields: Name, Email, Role. I need that field Phone was on the form. Is it possible to customize this form? I'm afraid it's not possible to customize the form at this time. I did some hunting in our Product Feedback forum, and found this thread: Add a user. It's a fairly new thread and doesn't have a whole lot of action on it yet, but I'd encourage you to add your vote and detailed use case so our Product Managers will be sure to see it!